At work, we’ve received the first of our new wave of Macs. Here’s the beauty I get the good fortune of using. 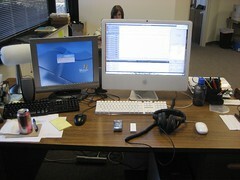 Right now, I’m editing the next four SpoolCast audio podcasts on this 24in iMac. They’ll drop on BrainSparks as soon as they’re ready.